It was living in Belize, that started my obsession with fried plantains. I remember waiting for the lunch truck, at school and always looking forward to it, along with (what I still crave after almost 10 years) Stewed Chicken, Rice and stewed beans. However, despite my fondness, I never made it because of the fact that it required frying. For dinner the other day, I decided to go the Caribbean route with some Grilled Jerked Chicken and I needed a side dish. My thoughts immediately went to fried plantains. The thought of frying and standing over a hot frying pan, in the current heat wave, immediately turned me off but I still wanted some fried plantains. So, I said to myself…lets compromise and oven fry. Oven frying take less time, uses less oil and I don’t have to be in my kitchen while its cooking. Win/Win situation! 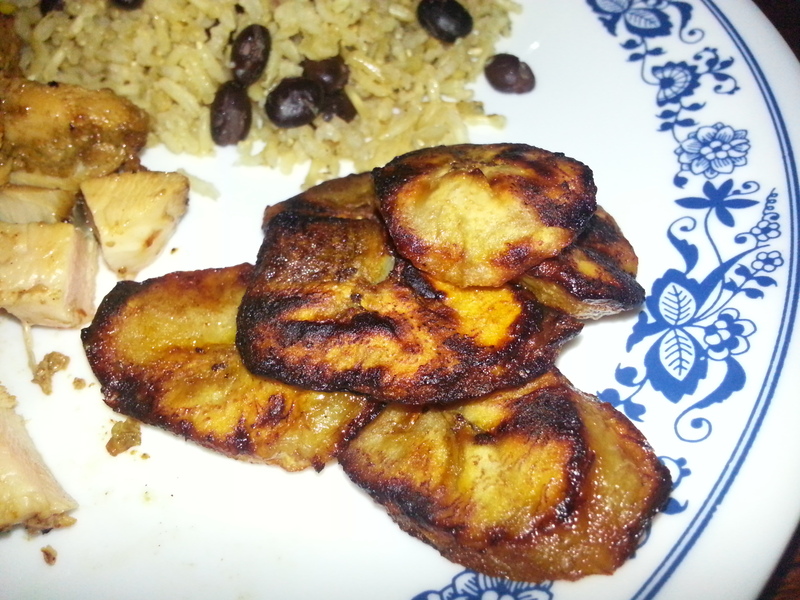 After removing the outer skin, make 1/4th – 1/2 th inch slices of the plantain.